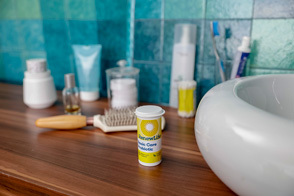 “Our Ultimate Flora Probiotic Fizzy Drink Mix answers the need for adults who have difficulty swallowing capsules, or for those who simply appreciate a great-tasting new way to support digestive and immune health,”*stated Bonnie Cooper, Renew Life Vice President of Marketing. Popping with probiotic power, each serving of Ultimate Flora Probiotic Fizzy Drink Mix contains either 10 or 15 billion live cultures per serving from 5 beneficial probiotic strains to promote digestive balance and support immune health―all in a delicious drink mix bursting with fruit flavors. * A snap to make, just add water for a sparkling dose of good-for-your-gut ingredients. * They are available in 10 convenient single-serve packets per carton in mixed berry and raspberry lemonade flavors to enjoy at home or on-the-go. All Ultimate Flora probiotics are guaranteed for quality, purity, and potency through expiration, and have no artificial ingredients. Why Choose Ultimate Flora Probiotics? Clearwater, FL (August 2015)—Renew Life™, a leader in natural digestive wellness, announces their best-selling CleanseMore herbal colon cleansing formula was awarded top honors as a winner of the coveted Vitamin Retailer Vity Award. Vitamin Retailer is a leading trade magazine in the dietary supplement industry, and products chosen for Vity Awards are judged on ingredient quality, targeted health benefits, and popularity with consumers. CleanseMore is sold in natural health food stores and fine retailers everywhere. For nearly two decades, Renew Life has been empowering people to elevate their quality of life through better digestive health. Renew Life formulates their digestive care supplements with superior-quality ingredients, and they stand behind the quality, purity, and potency of every product. For additional information on Renew Life’s CleanseMore, please contact bcooper@renewlife.com. Clearwater, FL (June 23, 2015) – Renew Life’s Ultimate Flora™ Women’s Complete 90 Billion Probiotic has been recognized as a finalist in Delicious Living magazine’s annual supplement awards in the Best in Women’s Health category. Ken Vargha, Renew Life’s Senior Vice President of Sales and Marketing stated, “Renew Life introduced Ultimate Flora Women’s Complete in 2013 to target a woman’s unique needs so they always feel their best.‡ It has become one of our best-selling Ultimate Flora probiotics because it supports not only digestive and immune health, but also vaginal and urinary health.‡ We’re committed to helping our consumers feel better about their digestive health and are honored that Delicious Living has recognized this quality probiotic two years in a row.” Delicious Living is a monthly consumer magazine focused on healthy lifestyles. High-potency and multi-strains are important to support the gut’s natural harmony of over 100 trillion diverse bacteria.‡ Ultimate Flora Women’s Complete Probiotic is a high-potency, multi-strain probiotic with 90 billion live cultures and 12 strains per capsule of the most scientifically researched, beneficial probiotic bacteria—Bifidobacteria and Lactobacilli. It is designed to re-establish digestive balance and support immune health, and contains Lactobacilli to promote vaginal and urinary health.‡ Packaged in Renew Life’s signature Fresh-Assure glass bottles, Ultimate Flora Women’s Complete Probiotic is dairy and gluten-free and features delayed-release capsules to help protect the probiotics from stomach acid. Renew Life believes that better health begins with better digestion. For nearly two decades Renew Life has formulated superior-quality digestive care supplements to help people achieve optimal health from the inside out.‡ The company stands behind the purity, potency, and efficacy of every product, and its commitment to help people renew their lives through good digestive health. “We are honored to accept this Essentials award from Taste for Life, and so excited about this new shake,” stated Ken Vargha, Renew Life’s Senior Vice President of Sales and Marketing. “We believe Ultimate Shake will appeal to a wide range of people because it’s full of all the ingredients you would want in a nutritional shake, and nothing that you wouldn’t,” Vargha concluded.‡ Taste for Life is a consumer magazine focused on healthy lifestyles. New Renew Life Skinny Gut Ultimate Shake is a great way to support healthy digestion, curb hungry appetites and help build muscle.‡ Available in natural chocolate or vanilla, each delicious serving contains 20 grams of plant-based, grain-free, organic protein; 10 grams of organic acacia fiber, 10 billion Ultimate Flora™ probiotic cultures, a full-spectrum digestive enzyme blend, vitamins, minerals, antioxidants, and less than 150 calories. Ultimate Shake does not contain any gluten, dairy, added sugar, preservatives, or artificial ingredients. Renew Life Skinny Gut Ultimate Shake is sold in natural health food stores and fine retailers everywhere. Renew Life believes that better health begins with better digestion. For nearly two decades Renew Life has formulated superior-quality digestive care supplements to help people achieve optimal health from the inside out.‡ The company stands behind the purity, potency, and efficacy of every product, and their commitment to help people renew their lives through good digestive health. For additional information on Renew Life Skinny Gut Ultimate Shake or other Renew Life Skinny Gut nutritional supplements, please contact Bcooper@renewlife.com. Renew Life has been honored with a 2015 Natural Choice Award from Whole Foods Magazine for their best-selling Ultimate Flora probiotics. Readers voted Ultimate Flora probiotics as the #1 best-selling probiotic brand in the Digestive Health Supplements category. “We are very pleased to accept the Natural Choice Award from Whole Foods Magazine,” stated Ken Vargha, Renew Life’s Senior Vice President of Sales and Marketing. “At Renew Life, we believe that good digestion is at the core of a healthy, happy life. Our Ultimate Flora is a comprehensive brand of high-potency probiotics that support both digestive and immune health.‡ We’re committed to helping our consumers feel better about their digestive health, and are thrilled to be recognized by Whole Foods Magazine readers for our quality products.” Whole Foods Magazine is a monthly trade journal for the natural foods industry. Renew Life Ultimate Flora Probiotics are available in a variety of formulas to suit individual needs, and can be found in health food stores and major retailers nationwide. Renew Life believes that better health begins with better digestion. For nearly two decades Renew Life has formulated superior-quality digestive care supplements to help people achieve optimal health from the inside out.‡ The company stands behind the purity, potency, and efficacy of every product, and their commitment to help people renew their lives through better digestive health. For more information about Renew Life Ultimate Flora probiotics, please contact Bcooper@renewlife.com. 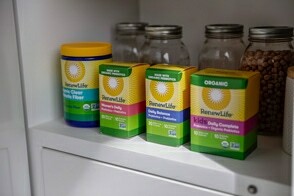 Clearwater, FL—January 29, 2015—Renew Life, America’s #1 Digestive Care Company, introduces Renew Life Skinny Gut nutritional supplements—a revolutionary new brand of certified organic, grain-free shake and fiber formulas that help promote digestive system balance to help achieve a healthy weight. “I am so proud to reveal this new line of quality shake and fiber formulas,” announced Renew Life president and founder, Brenda Watson. “These products, along with lifestyle changes, help promote digestive system balance for healthy weight management. Our mission was to create superior quality, great-tasting shake and fiber formulas, full of all the benefits you want, and nothing that you don’t,” Watson concluded. New Renew Life Skinny Gut Ultimate Shakes are a great way to help build muscle, support healthy digestion, and curb hungry appetites. Available in natural chocolate or vanilla, each delicious serving contains 20 grams of plant-based, grain-free, organic protein; 10 grams of organic acacia fiber, 10 billion probiotic cultures, digestive enzymes, vitamins, minerals, and antioxidants. The shakes do not contain any added sugar, preservatives, artificial ingredients, gluten, or dairy. Renew Life introduces two new fiber products – Renew Life Skinny Gut 100% Organic Acacia Fiber and Organic Fruit & Acacia Fiber. Both formulas are certified organic, easy to mix, and provide 5 grams of soluble fiber per serving to promote digestive health and weight management. Acacia fiber is an excellent soluble fiber because it is a “prebiotic” fiber that promotes the growth of beneficial bacteria in the digestive tract. 100% Organic Acacia Fiber is flavor-free, and the Organic Fruit & Acacia Fiber is flavored with real organic fruit. A leader in natural digestive care, Renew Life Formulas was founded in 1997 by Brenda and Stan Watson on the premise that vibrant, lasting health can only be achieved with a properly functioning digestive system. The company offers a full spectrum of award-winning, digestive-care supplements, formulated from the highest quality ingredients derived from nature, with no added artificial ingredients. Renew Life stands behind the purity, potency, and efficacy of every product.